Michael Macdonald broke his ankle and unsuccessfully sued Comhairle Nan Eilean Siar for £20,000. 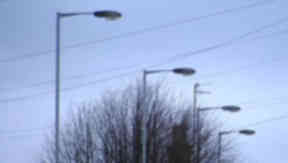 A man who fell over and broke his ankle and blamed the injury on street lights being turned off has lost a £20,000 damages claim agains the local council. Michael Macdonald, 30, took Comhairle Nan Eilean Siar to the Court of Session in Edinburgh in the hope that judge Lord Matthews would award him compensation. Mr Macdonald broke his ankle after he fell at around 2am during a two minute walk home on a Hebridean island on November 27, 2011. He alleged the accident happened because the Western Isles Council had decided to switch the lights off. But on Thursday, Lord Matthews ruled that Mr Macdonald had nott been successful as his lawyers had not proven their case against the council. In a written judgement issued at the court, Lord Matthews wrote: "Since that is not made out there can be only one result. In June, Mr Macdonald told the court that it was dark at the time of the accident which occurred about 2am on November 27, 2011. He said: "If you put your hand up in front of your face you couldn't see it." Mr Macdonald had earlier finished work at the Lochboisdale Hotel in South Uist where he worked as a chef and gone to visit a friend. He said that during the journey home he realised that he had left keys at the friend's house and turned around but caught the edge of a kerb. He said he had been expecting street lighting to be on. "I didn't have a torch or my mobile phone. I would have taken a torch if I had known they were off," he said. His counsel Andrew Hajducki QC asked if he was sure he would not have had the accident if the lights were on. He replied: "Very sure." Mr MacDonald, now of Bornish, South Uist, said he had lived in Lochboisdale for about two years at the time of the incident. He said the lights would stay on all night. Mr Hajducki asked him if there were any sign up telling him the lights were going off. He said: "No." He said there was nothing put up on lampposts informing that this was going to happen and a torch should be carried. Mr Macdonald said all the houses were dark at the time and there was no other lighting. He said he was left hanging onto the lamp post after the accident before people came to his aid. He said: "I couldn't stand." The court heard that staff at the hotel might be using the street after midnight along with patrons and that the Barra ferry occasionally came in after then. The action claimed he could not see where he was placing his feet because the street lighting which would have lit the area had been switched off by the council. It said the local authority knew or ought to have known that Lochboisdale had a population of about 300 residents. Mr Macdonald said he still gets a lot of stiffness and a lot of swelling following the fracture to his ankle. However, his legal team failed to prove the accident was the council's fault. Lord Matthews also ruled that Mr Macdonald should pay the council's legal expenses.